After commercial success with Memento in 2000, Christopher Nolan moved on to remake a Norwegian film that would cement his place as one of the great high-concept thriller directors in showbiz. In 2002, he released this weekend’s movie recommendation: Insomnia. Al Pacino plays Detective Will Dormer, a legendary detective of the LAPD. Dormer and his young partner Hap (played by Martin Eckhart) are on secondment to a provincial Alaskan town to help solve the murder of a seventeen year-old girl named Kay Connell. The town is unremarkable in most every way, except—asÂ the eager-to-impressÂ cop named Ellie Burr (played by Hilary Swank) explains—this far North, it’s difficult to maintain a grasp on the fact that it can be ten o’clock in the evening and still dazzlingly bright outside. This is no trifling matter for Dormer, as this perennial daylight produces the titular insomnia that soon desperately confuses his otherwise famously expert judgment. It’s that judgment, far more than the whodunit surrounding Kay’s murder, that is Insomnia’s focus. Dormer’s relocation to the wilderness occurs amidst an Internal Affairs investigation that he knows will eventually uncover his past indiscretions, and his partner’s dwindling friendship is unlikely to insulate him from an imminent demise. Indeed, solving the murder is so straightforward that we aren’t even treated to alternative theories about who the culprit might be. Before long, a mediocre novelist named Walter Finch—played superlatively by Robin Williams—approaches Dormer and confesses to the crime. No suspense there. Finch even appears to be rather a hapless old sod, whom Dormer ought to have no trouble at all dispatching with in little to no time. But, as is Nolan’s wont, the assorted plot threads come together with impressive neatness and tidiness by the third act: Dormer, worn thin by sleep deprivation, stages a badly-planned trap to capture Finch that goes horribly wrong. The consequence is that the stakes change drastically from what we thought we were getting at the film’s outset. Now, Dormer’s the one on the hook, and a solution may require making Finch his accomplice. Don’t expect the bravura performance Pacino made famous in films like Heat (reviewed here) or Devil’s Advocate or… or… Instead, Pacino’s Dormer is a lugubrious wreck of a man. He descends into frustrated madness at glimpses of sunlight piercing through the cracks in the sides of the hotel window, and he nervously fidgets and chews on gum just to keep his eyes open. Pacino’s characteristic physicality is definitely there, and yet again he inexplicably appears to have that same exclusively darkly colored wardrobe that’s followed him from film to film for the duration of his entire career. However, his performance in Insomnia is wildly different in tone and feel from what Pacino, and most murder thrillers for that matter, usually promise. The continuities with Nolan’s previous work (e.g., Memento) and his subsequent films (e.g., Interstellar, and the Dark Knight trilogy) place Insomnia in a strong tradition of exploring the limits of human judgment in desperate settings. Yet the triumph of this film is that it manages to be just as successful in that ambition without making use of the sophisticated tromps l’oeil that make those other films so enthralling (The Prestige takes the cake on that front). Instead, Insomnia is simple—banal, even—with its conceit, and its execution resembles in form many other films of its genre. What distinguishes this film from the rest of Nolan’s canon is that neither does Insomnia rely on theatrical innovations, nor is it remotely as dynamically paced as the cinematography that people now ordinarily associate with Nolan’s work. In fact, the pacing of Insomnia is deliberately sluggish, which falls far afield of the register in which we’re used to seeing Nolan work. All the more impressive that it’s riveting, from start to finish. 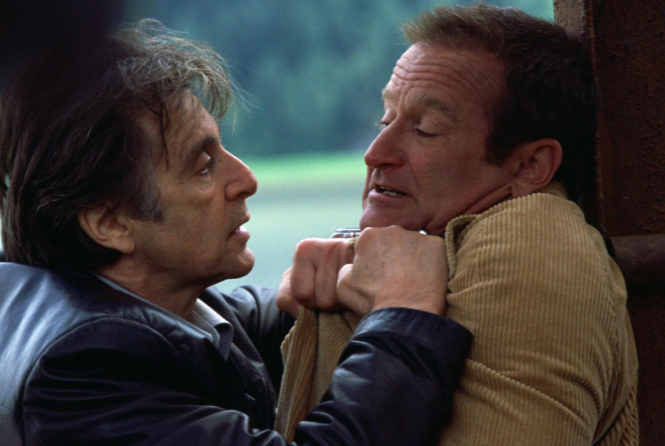 Yet as much as I laud Pacino and Nolan, it’s Williams who really shines in Insomnia. There’s a tenderness that he brings to the role that is so oddly relatable, even when describing in some detail how he came to murder a teenage girl he was entrusted to mentor. Never before has that soft timbre of Williams’ voice and that cheeky boyish smile been used so terrifyingly well.